Thomas Ernest Woods Jr. (born August 1, 1972) is an American historian, political commentator, author, and podcaster. Woods is a New York Times Best-Selling author and has published twelve books. He has written extensively on subjects including the history of the United States, Catholicism, contemporary politics, and economics. Although not an economist himself, Woods is a proponent of the Austrian School of economics. He hosts two podcasts, The Tom Woods Show and Contra Krugman. Woods holds a B.A. from Harvard University, and M.Phil. and Ph.D. from Columbia University, all in history. He is a senior fellow of the Ludwig von Mises Institute in Auburn, Alabama and a member of the editorial board for the Institute's Libertarian Papers. Woods was an ISI Richard M. Weaver Fellow in 1995 and 1996. He received the 2004 O.P. Alford III Prize for Libertarian Scholarship and an Olive W. Garvey Fellowship from the Independent Institute in 2003. Woods was a founding member of the League of the South and an early contributor to the League's journal, The Southern Patriot. His association has generated criticism, but Woods asserts his involvement with the group was limited and the group itself has changed since his early involvement. Woods is the author of twelve books. His book The Politically Incorrect Guide to American History was on The New York Times Best Seller list for paperbacks in 2005. The book has been criticized by journalist Cathy Young as being inaccurate, as well as by Ronald Radosh and Max Boot. His 2009 book Meltdown also made the bestseller list in 2009. His writing has been published in numerous popular and scholarly periodicals, including the American Historical Review, the Christian Science Monitor, Investor's Business Daily, Modern Age, American Studies, Journal of Markets & Morality, New Oxford Review, The Freeman, Independent Review, Journal des Économistes et des Études Humaines, AD2000, Crisis, Human Rights Review, Catholic Historical Review, the Catholic Social Science Review and The American Conservative. Woods is a Rothbardian anarcho-capitalist and paleolibertarian. Woods is a former neoconservative and has been critical of neoconservative support for an aggressive and interventionist foreign policy; in place of this he has advocated non-intervention. In September 2015, Woods began Contra Krugman, a weekly podcast, with economist Robert P. Murphy that critiques The New York Times columns of economist Paul Krugman. The podcast seeks to teach economics "by uncovering and dissecting the errors of Krugman." ^ a b c Naji Filali, Interview with Thomas E. Woods, Jr., Harvard Political Review, August 16, 2011. ^ a b Woods, Tom. "About Tom Woods". Retrieved 10 February 2017. ^ a b c "Profile: Thomas E. Woods, Jr". www.mises.org. Mises Institute. Retrieved 11 July 2017. ^ "Editorial Board at Libertarian Papers". Libertarianpapers.org. Archived from the original on 2011-07-28. Retrieved 2011-08-10. ^ "First Principles – Banana Republic, U.S.A". Firstprinciplesjournal.com. 2009-03-02. Retrieved 2011-08-10. ^ Inferno New Media. 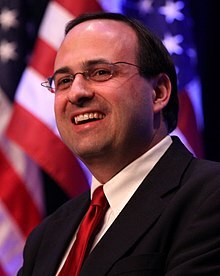 "About Tom Woods | Tom Woods". Thomasewoods.com. Retrieved 2011-08-10. ^ "ISI Announces 2006 Templeton Enterprise Award Winners". Applebome, Peter (7 March 1998). "Could the Old South Be Resurrected? ; Cherished Ideas of the Confederacy (Not Slavery) Find New Backers". nytimes.com. The New York Times. ISSN 0362-4331. Retrieved 28 September 2016. ...Mr. Woods, one of the founding members of the League of the South. ^ Young, Cathy (February 21, 2005). "Last of the Confederates". The Boston Globe. Retrieved 2016-09-14. The author's official bio leaves out the fact that Woods is a co-founder and member of pro-secession League of the South. ^ Young, Cathy (2005-06-01). "Behind the Jeffersonian Veneer". Reason. Retrieved 2016-09-14. Born and raised in the North, Woods is a co-founder of the League of the South, a neo-Confederate group, and has written frequently for its magazine The Southern Patriot. Woods, Thomas (1995). "The Abolitionists". Southern Patriot. 2 No. 5 (Sept. – Oct. 1995): pp. 36–37. ^ a b c Boot, Max (Feb 14, 2005). "Incorrect History". The Weekly Standard. Retrieved 2016-09-14. ^ "Review Essay of The Politically Incorrect Guide to American History by Thomas E. Woods, Jr". 2014-07-30. Retrieved 2016-09-28. ^ "LRC Blog LewRockwell.com". Retrieved 2016-09-28. ^ Woods, Thomas (10 May 2018). "What's the Deal With Woods and the 'League of the South?'". The Tom Woods Show. Retrieved 30 June 2018. Here [I] express admission of what was already obvious ...: this is not the League Jeffrey Tucker and I joined in 1994. ^ "Libertarian Anarchy: Against the State". 2014-03-14. Retrieved 2018-06-30. ^ Woods, Thomas E. (Presenter) (2008). The Catholic Church: Builder of Civilization (Television production). Episode 8: "Catholic Charity". Eternal Word Television Network. ASIN B00C30D3NG. Retrieved 2013-05-21. My personal favorite in this list is Martin Luther because I, myself, am a former Lutheran. ^ "A Profound Philosophical Commonality by Anthony Flood". Lewrockwell.com. 1987-11-22. Retrieved 2011-08-10. ^ Beirich, Heidi. "Two Treatises: A pair of recent books attack the Vatican and its current policies form the core of radical traditionalist teachings". Southern Poverty Law Center. Retrieved 2016-07-17. ^ Woods, Thomas E.; Ferrara, Christopher A. (2002). The Great Façade: Vatican II and the Regime of Novelty in the Catholic Church. The Remnant Press. ISBN 978-1890740108. ^ "Sacred Then and Sacred Now: The Return of the Old Latin Mass". BooksForCatholics.com. 2007-09-14. Archived from the original on 2008-05-01. Retrieved 2011-08-10. ^ "History and Truth: An Interview With Thomas E. Woods, Jr. by Bernard Chapin". Lewrockwell.com. 2005-07-23. Archived from the original on 2014-03-13. Retrieved 2011-08-10. ^ "Up From Conservatism – Mises Media". Mises.org. Retrieved 2011-08-10. ^ E. Woods, Thomas. "The Split on the Right". LewRockwell.com. Retrieved 2016-09-14. ^ "Haley, James W., The Standard Reader, Weekly Standard 01/31/2005". ^ "Woods, Thomas, A Factually Correct Guide for Max Boot, The American Conservative, 03/28/2005". ^ On Woods' association with Ferrara, see "On Chris Ferrara"
^ Also on audio book Archived 2011-07-08 at the Wayback Machine, as read by the author Thomas Woods. ^ Woods, Thomas E. "Beyond Distributism" Archived 2008-12-11 at the Wayback Machine. Acton Institute. October 2008.